When I began road cycling and first surveyed the lay of the land, the Tour of Bright seemed almost mythological. Here was a multi-stage tour with time-trialling and mountain climbing in the exquisite surrounds of Victoria’s high country. For an Australian amateur road racer this is as close as you can get to the general classification racing experience which defines the spiritual heart of the sport. 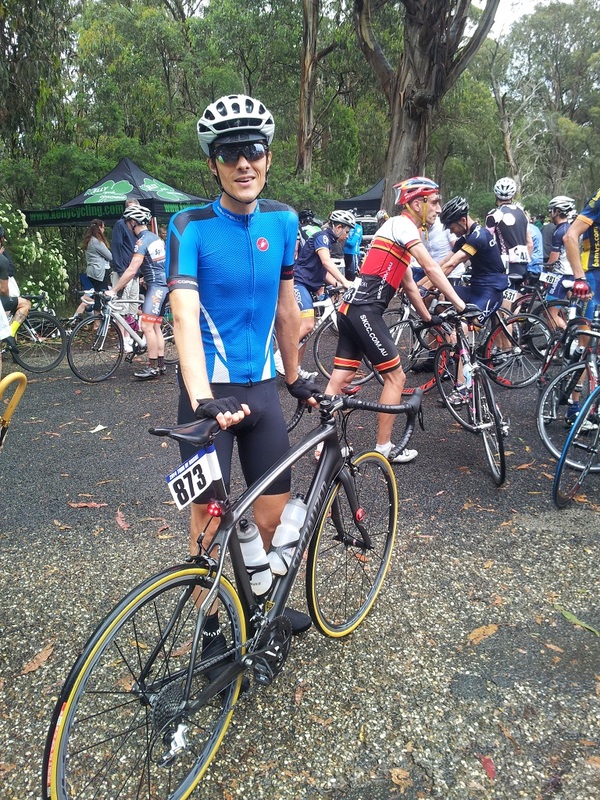 After having ridden a road bike for less than a year, and with only four months racing experience, I considered a last minute entry into the 2013 edition of the tour. A call went out that there were still some spots in C Grade Masters (C Mas) and I came very near to entering. In the end I wasn’t able to fit it in with other personal arrangements but I was also slightly frightened by talk in internet fora and wasn’t sure I’d be competitive. 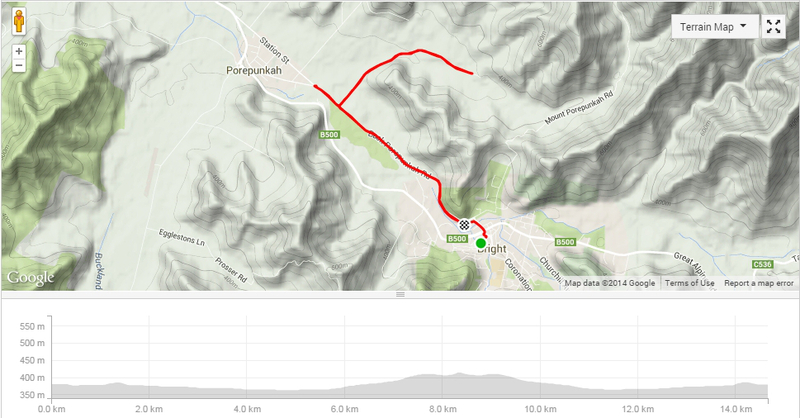 By the time of this year’s Mt Buller road race, however, I had a growing confidence in my ability to ride with the faster climbers in C Mas. I knew I’d be lining up at Bright for the 2014 tour. My preparation for Bright began after reaching a nadir of form early in the road racing season. I’d done OK at Mt Buller, coming eleventh (I’d been holding fourth place for most of the climb before fading right at the end). But after Buller I lost direction – partly due to non-cycling distractions, but mostly because I hadn’t adequately planned how I would follow up. I lost motivation, had a drastic reduction in my training volume, and gained a few kilos. I returned to racing at the Three Day Tour and pulled out at the start of the third stage. I’d managed to get a KOM point on the first stage but felt wrecked on day two and missed the start of my ITT! It was a depressing reality check and from this point I resolved to get my form back. I began to race weekly. Combining Northern Combine races with Veterans races I was sometimes able to race back-to-back on the weekend. All the while I was thinking of Bright. I was determined to eliminate the weakness that had made it hard for me to back up at the Three Day Tour. I got a couple of wins, both in Vets races, and my form began to come back together. With my training complete, and after three days of tapering trainer rides, we were on our way to Bright. Within a few minutes of unloading the car at our motel, we were out on the bikes (Katrina was playing the role of swanny for me this weekend, but was going to get in a few KMs herself). Riding over to the time trial course, the feeling of freshness after tapering was amazing. Then I suddenly realised – I had forgotten to bring my time trial helmet. My heart sank – I’d bought the helmet, a Specialized TT2, precisely for this race. Without much experience in time trialling I figured I was going to need every little technical helping-hand I could get. I tried to block it out of my mind and get my pre-race tune-up done – I felt really good on the bike in any case. Stage 1 course map (including the roll from my motel). A start time of 13:02 seemed an eternity away on Friday morning. But the memory of missing the start of my Three Day Tour ITT got me setting the bike up early. With my start drawing near I began my TT warm up on the trainer. I use a warm up based on one used by Team Sky which includes a progressive increase in heart rate to zone 5. I usually struggle to get my heart-rate up – it rests low (sub 40) and rises reluctantly. This time I got into zone 5 right on target. I was feeling ready. I rolled over to the start, where 600 riders were heading off in 20 second increments. Katrina was there already, in swanny mode, and she handed me a gel and some water. I saw Andrew, a fellow Coburg CC rider and one of the favourites to win GC, and wished him luck. There was an impressive array of TT machines on display, but also some guys who looked unconcerned with equipment. I was surprised how many guys were riding with their bidon holders on (some with two bidons) and without overshoes. Taking the holders off is an absolutely free time gain (you can survive 13.5km without a drink), and overshoes don’t cost much! 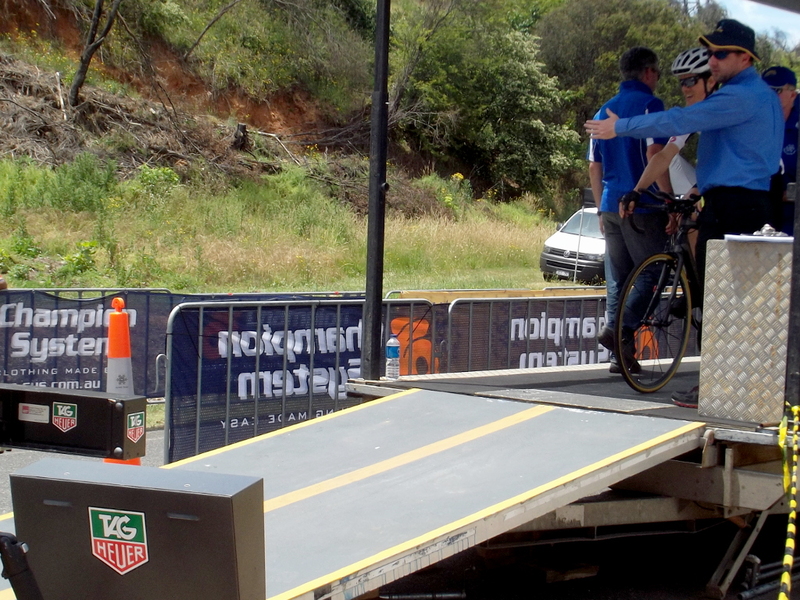 In no time I was at the top of the ramp, held in place by a couple of volunteers – then I was away. When I reconed the course a month earlier I had ridden it at a speed of about 38.5kph; assuming better output in the actual race I hoped to get 40kph (the winner of A grade would ride at 47kph). Over the first rise I watched my power numbers and then as I descended the other side I glanced at my average speed – it said something like 28kph!? I’d forgotten to reset my Garmin before the start and my casual roll over from the motel was now being factored into my average speed. ‘Look at something else!’ I thought. Of course I’d have an eye on my watts but I’d been anticipating watching average speed too. Maybe I could just look at my speed and do the maths on the fly – ha! Not likely. ‘Just go as hard as you can, keep your head down … catch the guy in front!’ Nearing the roundabout I knew I was going faster than my recon – I just had to keep it together. The climb flashed by and at the turn around someone with a largerphone (or something like it) was making a lot of noise for the riders. I was glad for any encouragement! But now I couldn’t see the rider in front and thought the rider behind might be gaining on me. ‘Go go go!’ Hitting the descent I struggled to hit the speed I wanted to, ‘come on, that’s too slow!’ I thought, but as I turned the corner for the run to the finish I couldn’t see the guy behind me. I might have been backing off slightly as I got to the final little rise before the descent to the line, but then I noticed I was closing in on a guy who was riding without aerobars. ‘You have to pick that guy off at least’ I told myself. I got him at the crest and descended to the line, perhaps backing off just a little right at the end. I’d done the course in an official time of 20:27:94 – a speed of 39.58 kph. This put me in 13th place at the time, but as I was starting halfway through the grade I suggested to Katrina I might end up around 30th. I wasn’t far off – with a final position of 29th out of 91 riders. Maybe I would have got my 40kph aim if I’d had my TT helmet, or if I’d reset my Garmin, or if I hadn’t backed off here and there? ‘So long as I don’t miss out on the top ten by ten seconds’, I said. That seemed unlikely! Back at the motel, thunder clapped and the skies opened. Some of the A Grade Masters guys would be TTing in the rain. Ironically, I’d asked Shane Miller on Twitter (after seeing the forecast) ‘Any tips for TTing in a thunderstorm?’ He’d replied: ‘Same as TTing any conditions…. keep your head down! :)’ He’d have to take his own advice, which of course he did – smashing the A Grade Masters guys for the win. It’s worth noting in A Elite, Masters A, Masters C and Womens B, the winner of the ITT went on to take GC. Only the winner of B Elite managed to come from outside the top TT times to take GC with climbing. Anyone with designs on the pointy end of general classification ignores time trial training at their peril! One of the great things about the race is having live results online. Justine, (Andrew’s wife and racing A grade women for Coburg) was able to tell me my time and position as soon as I’d crossed the line of the ITT. Sitting back at the motel I could watch the results rolling in. One feature of the timings website is the ability for anyone to add a comment, without immediate moderation. Andrew had succeeded in getting the best time in our grade. He was one of the favourites, he’d trained hard and bought a TT bike for the event. His result was very impressive. But under his result on the timings site, amongst a few congratulations, was a lot of nastiness. I couldn’t quite believe what I was reading. It seems par for the course that people complain about ‘sandbagging’ at the Tour of Bright where riders are accused of entering too easy a grade for their abilities, but calling someone a ‘dirty cheat’ is totally out of line. I had been surprised Andrew was racing C Mas myself, especially after he smashed Kinglake with a 16min time, which not so long ago would have been the KOM. But once it was explained to me that he actually couldn’t self-promote there was nothing more to think about it. His improvement over the course of his first year racing is impressive and worthy of respect from the rest of us. It’s also worth pointing out that he has been beaten in C Mas races through the year (including eighth place in his previous ITT), so although he might have hit a purple patch, a C Mas start was arguably fair in any case. If folks wanted to express a bit of quiet disbelief at Andrew’s strength, I think that’s OK, and I reckon he’d acknowledge that’s OK too. After all, disbelief is the flipside of wonder and some of his efforts have been pretty amazing. But the aggressive and anonymous online attacks revealed the worst side of the scene. This was really the only downside to the weekend. Waking from a poor sleep (make that two nights in a row) on Saturday morning I prepared for the biggest stage of the tour – the 92km Gaps Loop punctuated by the Category 3 Rosewhite Gap climb and finishing with the Category 2 Tawonga Gap climb (this is using the Strava definition of climb categorisation which I think is as legitimate a measurement of climbs as the UCI’s for two reasons: it’s consistent and nowadays everyone understands what it means. The UCI should adopt the same formula!). The weather looked sketchy, rain was forecast, but it had held off this morning. My one deference to the potential for a wet ride was to wear a rain cap under my helmet – this does a great job of keeping rain off sunglasses, which I prefer to wear in all conditions. Aside from that I was wagering we’d stay dry. I rolled down to the start line and realised I’d be starting on the back of the bunch. Not ideal, with almost 100 riders, but I’d work my way up once we got going. As we set off there was an awful amount of nervous energy and poor bike handling. Someone dropped a bidon in the middle of the bunch as we passed through the centre of town, guys were surging and slowing suddenly, squealing brakes setting everyone on edge. I got the impression that despite the race’s reputation for toughness there were quite a few guys here who don’t do all that much racing. I saw a lot of dangerous jockeying for position and was forced into evasive action to avoid collisions several times. It was perhaps the most stressful bunch riding experience I’ve had and the memory of hitting the floor after overlapping at Sam Miranda wasn’t far from my thoughts. I decided I’d stay put and work my way up at Rosewhite Gap. Along the way we passed the first sprint point. The behaviour of the C Mas bunch at these points has always baffled me. Instead of letting the sprinters go for it and come back to the bunch, the whole bunch accelerates with them! What’s the point? They’re not going to try a breakaway! I asked an A Grade woman staying at our motel if they do the same thing. Pretty much, she said. Of course I’m the opposite of a sprinter so I don’t like being made to do the extra work before the climbs, but it still seems novice to me! We’d averaged about 40kph to the sprint point and hadn’t lost much of that by the time we hit Rosewhite Gap. Quickly, the bunch fell apart and I was able to jump up towards the front. I was about 50m behind a small lead group, nearing the final crest, when I saw a guy amongst them hit the floor. I must have been able to see more from my angle than guys directly behind the crash and I watched several riders run into each other and go down. It was surreal too, because I was far enough back that I couldn’t hear any of it – all these bikes hitting each other, and the ground, silently. They were getting going as I caught them and I was impressed just how quickly Rod from Coburg took off after getting back on his bike – he powered away from me while I maintained a steady state. Then the descent. I’d suspected this would be the only really hazardous place in the tour; the fast winding curves from the top of Rosewhite Gap down to the floor of the Kiewa Valley. Straight away guys were taking risks to get ahead of each other down the hill. My descending has started to come good again after almost a year of being spooked by a bone braking crash. But as I was going past some guys, others were coming past me. Diving into one turn at around 60kph a rider was suddenly on my inside, forcing me to change my line to avoid an accident, ‘No no no!’, I shouted, ‘don’t do that – what’s the point! ?’ Sure enough, after the descent we were all back together – there had been no cause for heroics. From here everyone seemed to be happy to keep a sedate pace as we approached Tawonga. As we made our way along the valley it started to rain lightly. I had the thought that if there was a sudden and heavy downpour it might be funny to call out ‘raining’ (like ‘slowing’ etc) Thankfully I didn’t get to test this! One last sprint point; again the whole bunch accelerated and I found myself near the back as we hit the climb. I knew I was in a bad position, but with a climbing finish ahead of me I wasn’t too worried. 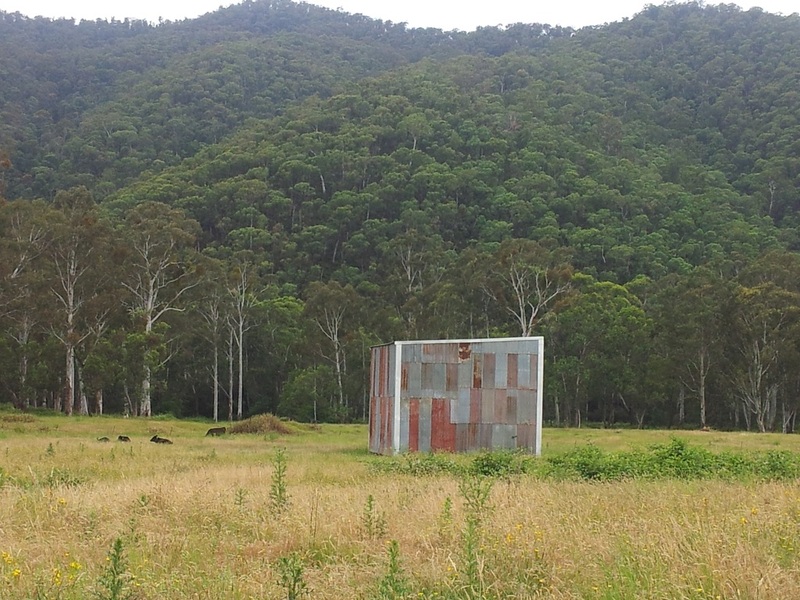 As we turned on to the Tawonga Gap Rd I started to gain positions. The road was soaked – we must have just missed a downpour. I passed a couple of Coburg guys, Stephen and Rod, and was feeling good. Now Marco from Hawthorn CC was up ahead – he’d had a good bunch position all day so I knew I’d overcome most of my bad start. About two thirds through the climb Rod appeared beside me. ‘Just hold tempo and pick them off’ he said. But Rod had found a second wind and I was one of the guys he picked off! I tried to hold on but he floated away to jump on the back of Marco’s wheel. They stayed at about 20metres from me until the last kilometre or so. I tried to lift my pace but as they drew away I realised it was too late to catch them. There was a crowd at the top and I heard Katrina call out. I saw the line and relaxed, only to have a rider in red Hampton Cycles kit pounce and beat me to it. I’d had no idea he was there and would have gone harder if I had. We’d been really lucky with the weather. Katrina said there had been an intense downpour at the top of the gap not long before we finished. I was pleased to get through to the end unscathed and to make up a few places on GC. Now I was 20th in the race overall. I saw Andrew and was glad to hear he’d got the win and had strengthened his hold on GC. Everyone was looking pretty bedraggled. It was clear a lot of riders had seen more rain than our grade. Back in the motel I looked at my numbers and was disappointed to see my power curve was way down on best output (which had been set across the board in the last month of training, so the capacity was there). I’d used a virtual partner on my Garmin the whole climb, to count down the distance to go, and just went as hard as I could. Or at least I thought I did. Evidently I had more in the tank. In fact, the difference was such that had I equalled my 20min power from five days earlier on Lake Mountain, I’m confident I would have been on the other side of Rod and Marco. The power numbers from the ITT had told a similar story. Some people will take this incredulously, though maybe some will relate to it, but for some reason I find I can go harder in training. I enjoy riding alone and I think being around others in a race situation confuses my sense of what I can do. I have a hunch that whilst I enjoy bettering myself, a lifetime of avoiding competition, before I found cycling, asserts some influence in the race context. My best race numbers have always come from solo breakaways. I’ve discussed this sort of thing here before, like at the end of my Mt Buller race report, and all I can do is offer the same platitude that this is something to learn from. Though the lesson may not be one that results in faster racing – it may be that I need to be happy accepting this is how I race. Still 20th place out of 91 guys who had started the tour wasn’t too bad. 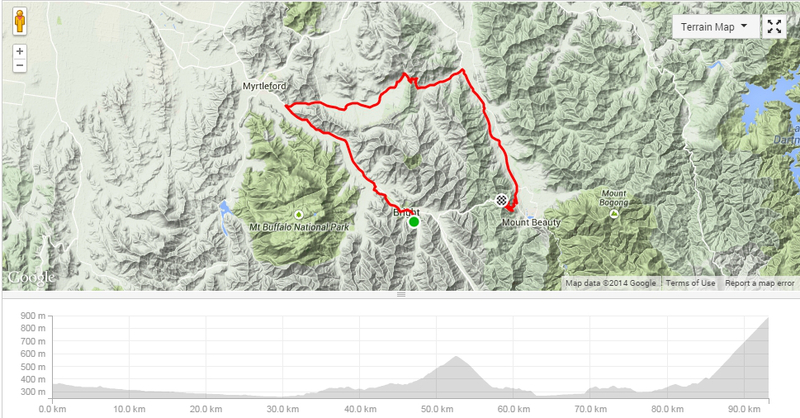 And there was an expectation that I would be in my element for the third stage ascent of Mt Hotham, especially with the two steep ramps that hit you right at the end of the climb. As we settled in on Saturday night it started to rain steadily. It had rained all through the night. I know because I was awake for most of it! Perhaps it was nervous excitement, with the expectation that I’d make something of the mountain stage. At least, as I got up, the rain had stopped. I felt dizzy with sleep deprivation, and set about waking myself up with enormous amounts of sugar – banana drizzled with maple syrup, Medjool dates opened up and filled with golden syrup, etc. The usual fare, but more of it! I took the rear bidon holder off to save weight and rolled down to the line for our 10:10 depart. Here we got the news – the course had been shortened due to bad weather on the mountain. It was OK at the start line but reports of high winds and torrential rain at the top meant the race would end eight kilometres early – cutting out the final steep climbs that would have suited me. 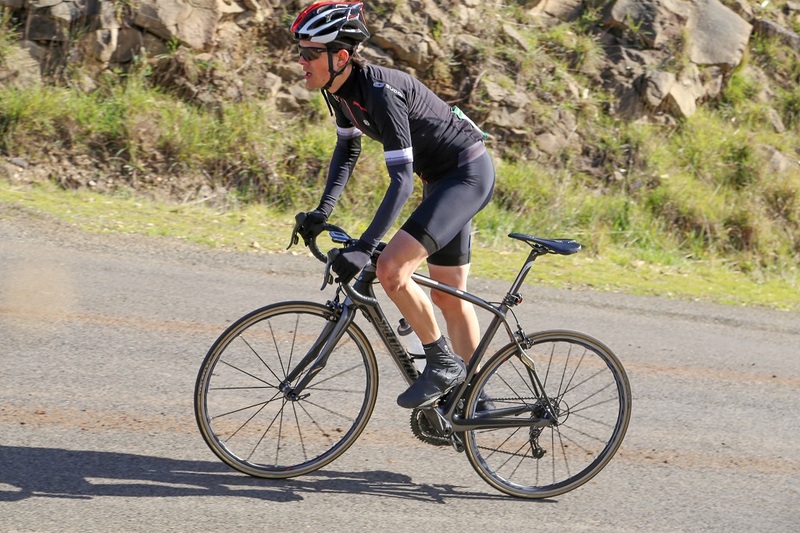 Mt Hotham is commonly described as a climb in three parts – a steep first third, a long false flat, and then two steep climbs at the end punctuated by diving descents, which in bad weather could get pretty dangerous. We’d be ending just after the false flat and I was going to have to work harder. The shortened Stage 3 ascent. I had some consolation. A quick survey suggested a fair bit of sleep deprivation in the bunch, and I figured that whatever fatigue I felt, most of the others did too. But as we rolled off I noted that my legs felt really good; so it was the old battle of Cartesian Dualism that cyclists know all too well. As Tim Krabbé says in The Rider, ‘People are made up of two parts: a mind and a body. Of the two, the mind, of course, is the rider.’ At least I had one half of the equation sorted, and I think I felt stronger each day of the tour – a vindication of my training. Rolling off towards Harrietville I could sense fatigue in the bunch and perhaps a sense of pointlessness for hammering towards the mountain. 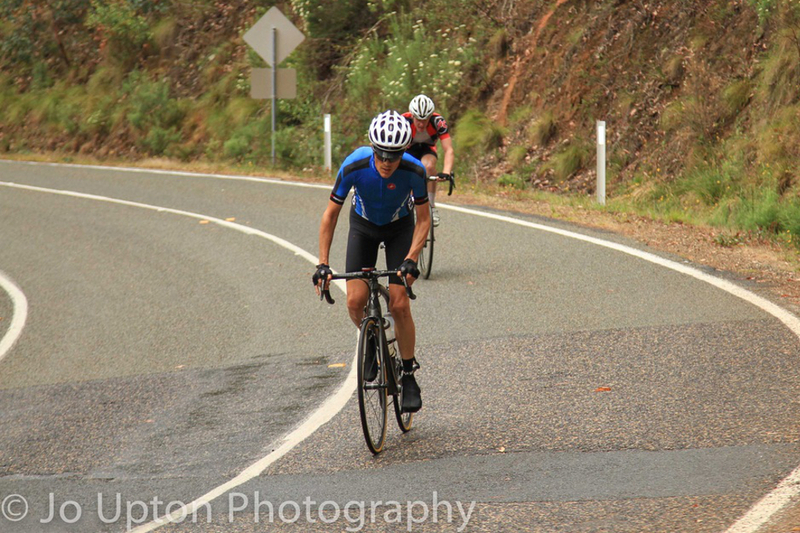 There was a rush again at the sprint point, but this time I went with it, and then something funny happened: seemingly two thirds of the bunch sat up the moment the climb out of Harrietville began. Within seconds there was a gap of several metres between guys who looked like they were going to contest the climb and guys who looked like they weren’t. I jumped up towards the front and got going with some encouragement from Chris, who took second at the Coburg Masters Road Champs. I felt good. Soon I was with the front group, joining it just in time to see Andrew powering off the front. In March he’d been beaten to the line at Mt Buller by Melbourne Uni’s Matthew Irons. Now Matthew sat in the front group with us as Andrew drew steadily away, demonstrating his growth over the year. I sat about ten riders back, keen to stay near the front, but I started to think we were going slower than I would if left to my own devices (I was trying to draw some lessons from the previous days numbers, see). I pressed ahead through a corner and pushed on at the front of the group. Maybe this wouldn’t last – I made sure to savour the moment. Andrew was somewhere up the mountain, out of sight now, but I was at the front of the rest, leading a select group of the best climbers in my grade. With 500 meters to go to the KOM point I was passed by Matthew and then a couple of others. Then just as I neared the crest, Marco and a couple of others went passed. There were two groups behind Andrew now – Matthew’s, with four riders, including a couple of interstate guys, and a little further behind there was Marco’s, which was a group of about nine riders. Then there was me and a couple of others hanging just off the back of Marco’s group. I dangled there, sometimes within a bike length of getting back on, sometimes as far back as ten metres. I was almost back on when they hit the false flat before me, accelerated, and got away. I was chasing Marco’s group now, with three others. Behind us there was no one as far as you could see. An older rider in Specialized kit took the front and towed us for most of the false flat, shouting angrily and flicking his elbow. I took over for a bit but the older rider must have reasoned he’d have more chance of getting across if he did the work himself and he came back to the front. I looked around and there was the rider who had pipped me on the line the day before, in his red Hampton kit. The mountain was sorting everyone out into their appropriate rank. As we chased Marco’s group along the false flat we rode through a rain squall and a blast of cold air. This was about as bad as it got for us but a casual glance at the photos of other grades shows how lucky we were. Our grade really dodged the worst of it all weekend. The false flat came to an end and immediately we were closing in on Marco’s group, which was clearly fracturing. The older guy in Specialized kit and the fourth rider in our group jumped off in a last effort to bridge the gap. I wasn’t sure what to do, or how much distance I had left to work with. I picked off two guys who seemed to have come to a standstill from the other group but before I could start to feel good about it I heard the P.A. from the finish line. It was just going to be me and the Hampton kit rider going for the line together again. This time I just beat him, though it turns out we were given the same time for both stages two and three. My ITT was a few seconds better than this rider, Jason, which was all it took for me to finish two places ahead of him on GC. 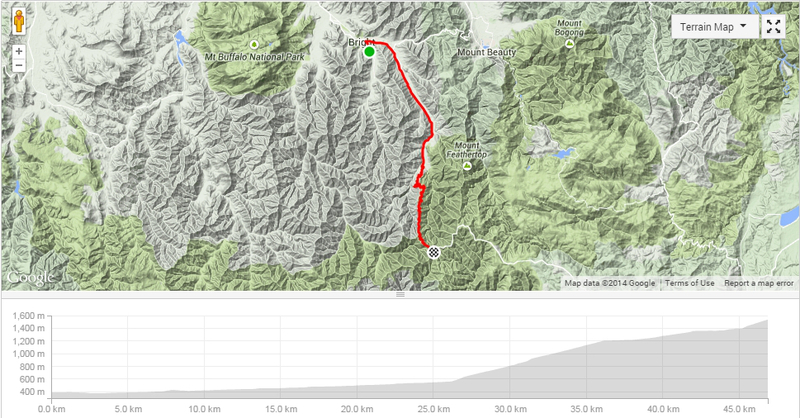 I knew I hadn’t done my best climbing, again (though we were on track for a Mt Hotham time in the low 1:20s). But I also knew I’d done OK against the rest of the grade. Assuming some of the guys who were ahead of me on GC finished behind me on the mountain I might just have wrangled a few places overall. GC was all I cared about at this moment, and seeing we had 4G at the finish line I went straight to the live results site. 13th! Though later I would start to think, ‘what if we’d gone to the top?’, I can’t forget that moment of excitement in seeing my final position on GC – to see I’d pushed myself up towards the top tier of riders in the grade. There was also more time between me and David Tennant (From Hawthorn CC, not Gallifrey) in 12th place than I could have made up simply wearing my TT helmet, so thankfully that whole crisis was moot. I’d made it through to the end of the tour, and with a relatively strong finish. So how did participation in this race measure up to my outsider’s reverence for it? Well, it’s really pretty special and the volunteers who made it happen can’t be thanked enough. After the rain on Stage 1 we’d wandered down to watch some of the A Elite men and women. Hearing that same count going every twenty seconds, and the thought that it had been going since before my TT and all the time we’d been back at the motel, made me realise what dedication and sacrifice was involved in making the event work. It’s really a huge operation. This race was the culmination of all my personal investment in cycling for the year. Whilst I can see mistakes and areas that need to be addressed and improved if I’m to keep doing this, I’m still greatly satisfied with the way it’s all worked out. It was all worth it. Great report Alain… I really felt like I was right there with you… some nice writing. I LIKE it Alain…The thinking tacticians review…you’re not afraid to put (turn) considered thoughts to paper (electrons) and give us another view in that detailed way. I love the lead up from the first year, your mind turned to the next year’s race following the research, then you raced it. Very inspiring to those left dreaming of it. Great work. With your power data, sitting in a bunch lowers the figures as you are resting (or at most, riding tempo). The soloing off the front beefs up your figures as you are applying power and actually having a bash. The key is to know how many matches you have and make sure you burn them only when needed. With the climbing, know your FTP and stick to what you know you can hold for the estimated duration of the climb. Thanks Paul, that’s good advice for anyone starting out with a power meter. If you’re referring to my mention of being disappointed with my power curve on stages one and two, the key efforts on these stages were 20mins or longer for me, so I should have seen better 20min power than in training, and I didn’t. In these stages it was a matter of burning everything at the finish of the stage – I just didn’t go hard enough. Knowing my FTP and previous best output didn’t help – at the end of the day psychological (possibly even neurological) factors saw me make a slightly lesser effort than I had set in training.